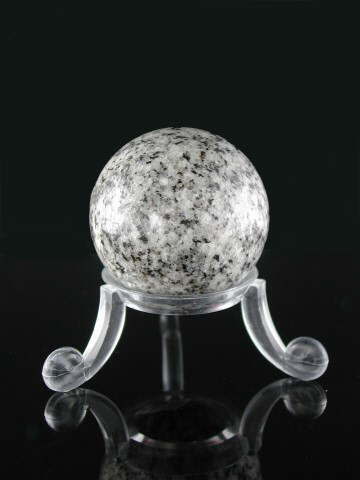 Lovely small grey Granite sphere from England. Granite is an ignious rock created from molton magma which was pushed up between layers of the Earth as it formed millions of years ago. It contains many different minerals, from Quartz to Feldspar and Mica. As the molton magma cooled these mineral inclusions crystallised in the rock. When cut and polished the crystallised minerals display a beautiful sparkle. Although Granite is formed under the Earth's surface, tectonic movement has pushed it to the surface in many places around the world. An example of this can be seen on the Cornish moors; which is where this particular sphere hails from. Due to the many crystallised mineral inclusions in Granite, it has many metaphysical properties, including those of Clear Quartz and Labradorite.